Summary: September once again returns to Fairyland, but this time it is much different than she remembers. Forced to fight her own shadow, the Hollow Queen who has been stealing the shadows into Fairyland-Below, September is tasked with saving magic and the inhabitants of Fairyland-Above before it is too late. 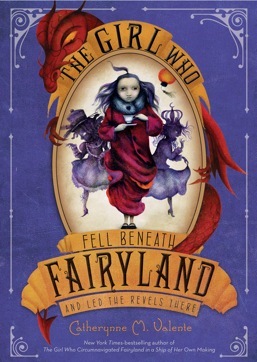 Starring some familiar yet shadowy faces, this sequel to The Girl Who Circumnavigated Fairyland in a Ship of Her Own Making is another grandiose fantasy from the talented Catherynne M. Valente. Generally, the epic fantasy moniker is reserved for the likes of Lord of the Rings (HAPPY TOLKIEN WEEK! btw) and A Song of Ice and Fire– that is series with orcs and death and magical objects. But I would like to argue for The Girl Who… series, or the Fairyland series so as not to confuse it with the Swedish computer hacker books, as an epic fantasy in its own right. It’s a modern fairytale with lush prose, an enormous cast of characters, impossible magic, and even a dragon or two. Valente gives it all the trappings of a fantasy- including prophecies- and despite my dislike of the word I would definitely refer to it as “epic”. I rest my very shoddy, not so well thought out case. 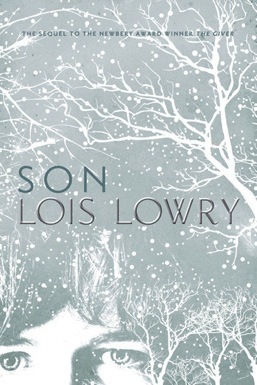 Since the first book in the series was my hands-down favorite book of 2011 (you can read that review here) even beating out the amazing Night Circus, this book had big shoes to fill. It didn’t quite meet my much raised expectations, but it came pretty close. It wasn’t perfect in every way The Girl Who Circumnavigated was, but the fabulous writing, intriguing new characters and the highbrow parody was more than enough to get me past that. If only my brain wouldn’t rate or judge things based on other things! 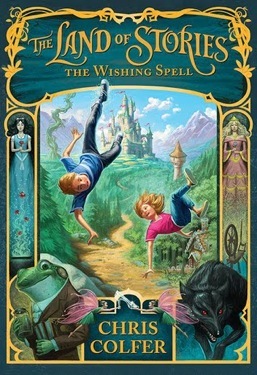 Summary: Twins Conner and Alex’s lives are turned upside down when they fall into the Land of Stories, a book full of fairy tales. After being befriended by a talking frog conveniently named Froggy, the twins learn that in order to get home they must collect the items needed for the Wishing Spell, a wish that will allow them to return home. What follows is an adventure full of situations where our dynamic duo needs neither brains nor brawn to assure their success. Just a ton of good luck. Here we go, another book written by a celebrity. Trust me, it’s not ghost written, but maybe it should have been. I am always a little reticent to pick up a celebrity book (you will not see me with Tyra Bank’s Modelland or anything by Snooki, Hilary Duff, and Lauren Conrad). That’s not to say if it’s written by a celebrity, that it’s automatically awful- John Lithgow and Fred Gwynne wrote great children’s books, and Carrie Fisher has two hysterical memoirs. There’s nothing wrong with celebrities writing if they’re actually good at it. However, if they’re given a book deal based on their celebrity alone, that’s when I have a problem. As you may have gleaned from my BEA wrap up, I had high hopes for this novel. It covers one of my favorite genres: fractured fairy tales and the concept sounded intriguing: two twins fall into the land of fairy tales and meet Queen Riding Hood, discover that Goldilocks is a wanted woman, and the Evil Queen is wreaking havoc across the land. Unfortunately, it fell short of all my expectations. Even the pretty cover and interior artwork (all by Brandon Dorman) couldn’t save the book this time. Nice try publicity team, trying to trick me into thinking this was a good children’s book. BookExpo America is a four day event in New York City celebrating all things bookish. From physical books to digital publishing, the conference unveils the hottest titles for the fall, and is the biggest book trade fair in the United States. The event is open to industry professionals like bloggers, book retailers, librarians, and the press and is the go to place for ARCs (advanced reader copies), getting author autographs, and meeting tons of contacts in the book publishing world. Networking and book appreciation is what makes BEA so wonderful and exciting, you will never find yourself in such a literary centered environment. Reading isn’t weird at BEA, it’s recommended. Besides getting to meet authors, network, and connect with fellow book enthusiasts, BEA is all about the swag. In the two days that I walked the floors of the Javits Center, I picked up 12 books, 3 totes, 2 pins, 1 wand, 2 preview samples, and 1 attache case. Unlike some other BEAers, I was very selective with what I picked up. Not only did I not want to drag too many books around with me, but I didn’t want to take books home that I would never read. Especially if other book lovers really wanted that book which held no interest to me. It’s surprising how people are so willing to just grab books willy nilly that they will most likely never read.